There’s been a lot of buzz about two Americans infected with Ebola virus being transported back to the US. Some internet sources/comments are full of misinformation about the virus and how it’s spread, so I thought I’d provide some helpful information to help alleviate the hysteria. OMG EBOLA IN THE USA!!! Don’t get me wrong, Ebola is very serious – but it isn’t going to spread like wildfire across the states now that these patients have arrived. Most commonly, the virus is contracted by direct contact with the blood or bodily fluids of an infected person (or animal). This can happen by sexual contact, using dirty needles, or treating an infected person without proper protective equipment. So as far as the infected Americans, if you’re not their doctor and you’re not planning to have sexytimes with them, you’re probably okay. So chill. 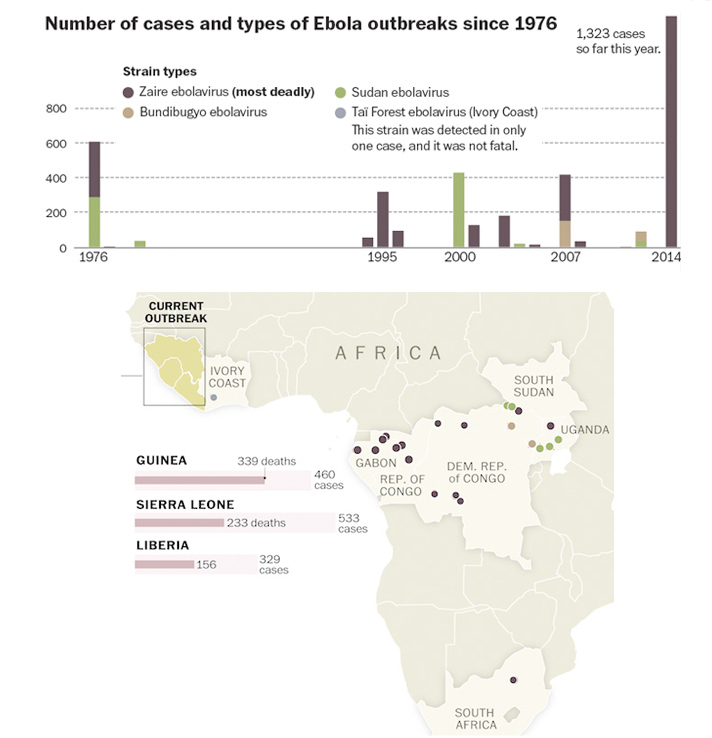 Here’s the scoop – Ebola is a big problem in Africa. The first outbreak was in 1976 in the Democratic Republic of the Congo, and since then every outbreak involving humans has also occurred in Africa. The current outbreak is the worst we’ve ever seen and is caused by the most deadly of the five ebolavirus types. As of today there’s already over 1600 cases and more than 800 deaths in 2014 alone. The largest “natural reservoir” for Ebola is fruit bats, meaning they are a long-term, asymptomatic host that allows the virus to spread to other species (like primates). Humans are often exposed by eating or preparing infected meat, and once infected the mortality rate can be as high as 90%. Symptoms start with fever and headache and rapidly progress to hemorrhaging in the organs and under the skin within 2-20 days. Considering the extraordinary deadliness of this disease, you’d think a vaccine would be top global priority, right? Well, unfortunately it’s not. If we get down to brass tacks, the sad truth is that drug companies aren’t interested in funding these research programs because Ebola usually infects less than 1000 humans each year. And those people are in remote and impoverished areas of Africa. Ok, sure, the money needs to come from somewhere, and they are companies, blah blah blah. I know, I get it, but it still pisses me off. However, not all drug companies are the pits. You might have heard that those two Americans we brought back were given an experimental drug while still in Liberia. It’s called ZMapp and it was developed by a company called Mapp Biopharmaceutical in San Diego based on previous work from other places like the National Microbiology Laboratory of the Public Health Agency of Canada. It’s nowhere near being FDA approved (seeing as it’s never been used in humans before), but it has shown promise in limited animal studies. Because Ebola is so crazy deadly it was considered less risky to try a new drug to leave them untreated, so both individuals consented and the world is hoping for the best. How does it work? It’s a mixture of three antibodies, those handy little proteins your body makes to fight off infections. However, the human body doesn’t make antibodies against Ebola on it’s own, hence the death rate, so that’s why we’re making them in a lab. When injected, they alert the body to the infection so that an immune response can be mounted. Originally, ZMapp was made using mice, but amazingly Kentucky Bioprocessing has developed a method for producing these precious antibodies in, of all things, tobacco plants. They’re even referred to as plantibodies. Oh, scientists. You slay me. Now that’s some wacky tobacky even your parents can get behind! Finally, I want to warn you that you must be very, very careful not to succumb to media hype. As of right now both patients are alive, but we have no proof that the treatment is to thank. It’s FANTASTIC that we were able to attempt this at all, and I really hope we’re on the cusp of Ebola eradication, but we are just at the beginning. The drug will need to go through properly controlled clinical trials to prove itself before it can be used for mass treatments in Africa. Some have criticized the fact that hundreds of infected Africans are not given access, while two white people were. Just remember that it would be insanity to rush over with no understanding of the risks and just start injecting people – for all we know it could kill as easily as cure. It could also garner mistrust of doctors if things go badly, potentially hindering future humanitarian efforts in this region. The American citizens were willing to be experimented upon and (importantly) able to give their consent. The need for clinical trials is real and hopefully they’ll be starting very soon for this and other possible drug regimens. But in summary, scientists are currently using tobacco plants to possibly cure Ebola… no matter how you slice it that is pretty rad. It’s like I’ve just read the beginning on a zombie novel.